Weak economic signals gave a boost to bond prices in the second quarter, but rising economic risk in the US makes it unlikely that the fast pace of debt issuance will be sustained, economists say. US investment-grade corporate debt volume increased 33% in the first half of 2011 over the same period a year earlier, according to Thomson Reuters. First-half volume for US high-yield debt was the highest on record. J.P. Morgan was the leading underwriter of debt issues worldwide in the first half, with proceeds of $212 billion from more than 700 transactions. Barclays Capital and Deutsche Bank were nearly tied for second place, with proceeds of about $210 billion. J.P. Morgan also topped the league tables for US debt underwriting in the first half, followed by Bank of America Merrill Lynch and Barclays Capital. Until macroeconomic risk levels are considerably reduced, the outlook for investment returns, financial liquidity and capital formation will be permeated by considerable uncertainty, Lonski says. While disaster is probably not on the horizon, the current environment means that the debt-issuance levels of the past 12 months are unlikely to continue, he adds. Through June 2011, year-over-year growth rates of overall dollar-denominated issuance were 17% for investment-grade corporate bonds and 75% for the sum of high-yield bonds and leveraged loan programs, according to Moody’s. “Over the coming year, we think the rate of increase will slow to 11% for investment-grade [debt] and to 8% for high yield,” Lonski says. The second quarter of this year showed outsize increases of 50% for investment-grade corporate debt issuance and 86% for high-yield debt and new bank loan programs, combined. Lonski believes that harder year-on-year comparisons and the likely absence of any major new spur to debt issuance suggest that the third quarter’s year-to-year percent changes will be mediocre at best. Unresolved issues related to Europe’s sovereign debt crisis are the biggest identifiable risk to the debt issuance forecast, Lonski notes. “On the positive side, partly because of elevated macro risks, US monetary policy is likely to remain highly accommodative, which is good for corporate debt issuance,” he says. The Federal Reserve wants financial markets to function in a manner that promotes economic expansion, and the Fed will probably respond forcefully to any disruptive reduction in financial liquidity, Lonski says, noting that positive corporate bond returns are crucial for issuance. 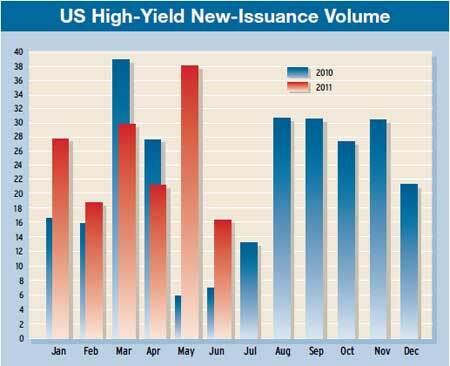 Total US high-yield new issuance volume for June 2011 was $16.2 billion, down sharply from $38.1 billion in May, according to KDP Investment Advisors of Montpelier, Vermont. However, June’s depressed level was probably exaggerated, Lonski says, as many issuers rushed to tap the market to avoid worsening conditions. Nevertheless, a continued upturn by the corporate credit cycle favors further expansion of corporate debt issuance, he says. Disappointing US and global growth caused the bond market rally to stall in the second quarter, says John Bender, head of US fixed income at Legal & General Investment Management America, a Chicago investment adviser. 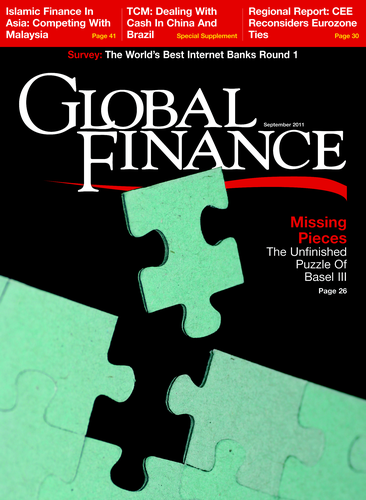 Japan’s earthquake-related problems, oil prices increases on the back of unrest in the Middle East and North Africa, Europe’s debt crisis and the proposed capital surcharges under regulatory tax reform on US financial institutions weighed on the market, as did uncertainty around the US debt ceiling increase, Bender says. Meanwhile, the Federal Reserve ended its second round of quantitative easing—known as QE2—at the end of June, although it is still reinvesting maturing issues in treasury securities. How long would the current soft patch in the US economy have to continue for the Fed to consider another round of quantitative easing, or QE3? Bender says it would require significant economic weakness, including a rise in the unemployment rate and a negative print for quarterly GDP before QE3 is likely. After two straight quarterly losses, Merrill Lynch’s global fixed-income markets index and most of its components gained around 2% in the second quarter. Despite strong headwinds, overall bond returns rebounded in the second quarter, as the carry made up for negative price returns. The carry return is the coupon on bonds minus the interest costs of short-term borrowing. Globally, corporate upgrades and downgrades were near parity for the third straight quarter, but regional results were mixed, according to Phil Galdi, head of global bond index research at Bank of America Merrill Lynch. “US upgrades were more than double downgrades, but the opposite was true in Europe,” Galdi says in a report. In the US corporate index, banks underperformed all other sectors, but the magnitude of the shortfall was not particularly significant, Galdi notes. “Domestic and foreign banks have each had their own issues to contend with, from mortgage losses to write-downs of euro sovereign debt, but they ended up with nearly identical excess returns for the [second] quarter and the past year,” he says. For the ninth consecutive quarter, financial services company issues ranked as the top sector for US investment-grade debt, accounting for more than 45% of second-quarter issues, according to Thomson Financial. Estimated fees paid to underwriters for global high-yield debt issues in the first half of 2011 rose 46% compared to the same period a year earlier, driven largely by the increased volume of issuers seeking funding. There were 142 more transactions priced in the first half of this year than in the first six months of 2010, according to Thomson Reuters/Freeman Consulting. For US debt transactions, estimated fees rose 17% over the same period a year ago, due primarily to increases in fees by issuers in asset-backed securities, which rose by 86%. In high-yield markets, fees rose 42%. 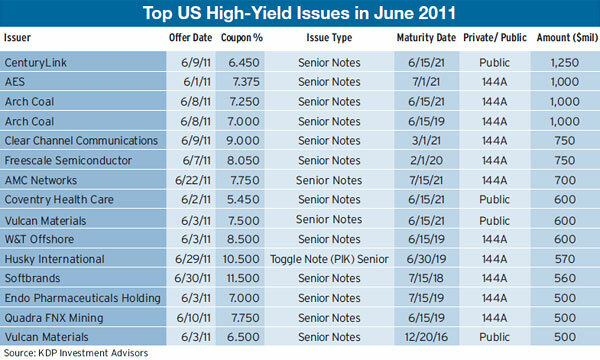 The $206.7 billion of global high-yield debt raised in the first half ranked as the highest first-half volume on record. Non-dollar-denominated global high-yield debt rose from $25.4 billion in the first half of last year to $43.9 billion in the first half of 2011, a 73% increase.